Learn, in depth, the fundamentals that will place practical tools in your hands. 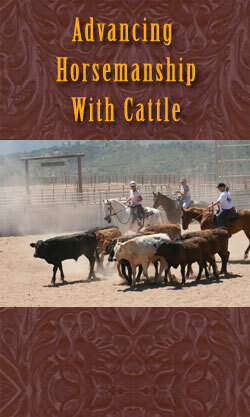 Spins, sliding stops, flying lead changes, and cattle working will be de-mystified during this advancing clinic. Through Richard’s “Four Part Harmony” exercises you’ll learn how to obtain the body control necessary for more refinement, collection, and performance. 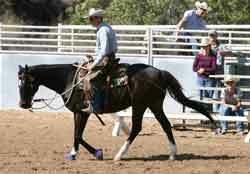 Riders will apply the principals taught to read and track cattle and to cut, hold, and control a cow. Requirements: Riders must be able to demonstrate control at the trot and lope. Horses must be able to stop, back, and yield away from leg pressure. Cost: $950: Includes 3 full days of structured hands on training, cattle working, dorm room, 3 meals per day, water and snacks, as well as horses board and feed. Limited to 15 riders. Participants arrive Friday afternoon, anytime after 2:00 pm to get their horses and themselves settled. We officially meet for dinner at 5:30 pm with orientation immediately following. We will conclude following breakfast Tuesday morning. Please call Richard or Cheryl at 805-640-0956 to register.